Want to go deeper? In Hard Knocks and Life Lessons, Abbott digs deeply into the treasure trove of the Bible and brings seven pivotal figures to vivid life. From Adam to Joshua, you can understand these men as never before. This book examines their lives, their successes, and their failures, and makes it clear how we can learn from it all. You will finish this book with a fresh understanding (and appreciation) for the lives and challenges of the patriarchs. Also available through Kindle, iTunes, and Kobo. 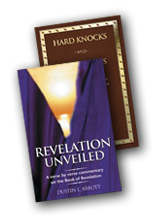 Purchase both Hard Knocks and Life Lessons and Revelation Unveiled for only 30 dollars. Revelation Unveiled tackles what many believe to be the most challenging book in Scripture. It is a challenge, but I have received many reports that my book has served to drastically increase many peoples understanding of this important book of Scripture. The book of Revelation is a treasure trove worth doing some digging for! My writing attempts to walk the line between depth and ease of understanding. This book is accessible to everyone but deep and thorough enough to answer a lot of the questions that many have when approaching the final book in Scripture. Many pastors have endorsed this effort and have incorporated Revelation Unveiled into their congregational teaching. Also available through Kindle, iTunes, and Kobo.